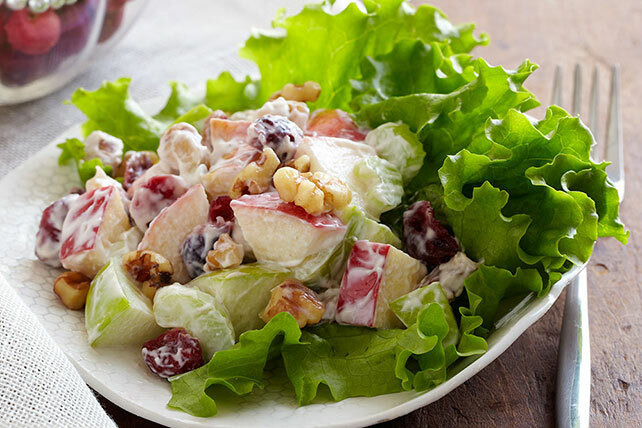 Discover our Apple-Cranberry Salad, a tart, sweet, creamy and crunchy meal. There's no end to the ways this Apple-Cranberry Salad manages to be delicious. Mix mayo, sour cream and sugar in medium bowl. Stir in all remaining ingredients except lettuce. Save 40 calories and 5g fat, including 1g sat fat, per serving by preparing with KRAFT Mayo with Olive Oil Reduced Fat Mayonnaise and BREAKSTONE'S Reduced Fat or KNUDSEN Light Sour Cream. Salad can be refrigerated up to 24 hours before serving.